PART OF PLANT – Rosemary herb. Anti-cellulite – due to Rosemary’s ability to increase blood circulation and waste removal, while reducing water retention, it has been effective in creating a smoother appearance for the thighs. Rosemary oil also tones puffy, sagging skin, making it the number one product for combating cellulite. Stimulates the nervous system, providing a coffee-like buzz. This makes Rosemary oil excellent for mental clarity, when you have to study, or complete an intense workload or workout. Painkilling – for muscle aches / arthritis / gout / rheumatism. Drop 30 drops of Rosemary Essential Oil into 4 oz of our Shea Body Butter. Stir thoroughly for several minutes. Its that simplel! 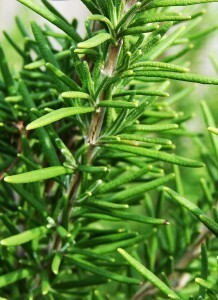 Special – Many studies and reports have cited Rosemary oil as encouraging new hair growth, in cases of thinning hair. Apply daily to scalp, rubbing the oil well into the roots of your hair. For blending dilutions, read our article – Blending and Applying Essential Oils Safely. Precautions – Not to be used by people with high blood pressure / Not to be used during pregnancy, or when attempting to fall pregnant / Do not use if you are epileptic / Do not combine with homeopathic remedies / Do not use a few hours before sleeping, as it may prevent you from falling asleep.